President Trump arrives to pay his repects and encounters protesters. President Trump, meanwhile, arrived in Pittsburgh to pay his respects and encountered hundreds of shouting, chanting protesters with signs such as “It’s your fault” and “Words matter,” a reference to allegations his bellicose language has emboldened bigots. Pennsylvania’s governor and the mayor of Pittsburgh declined to join him during the visit. Earlier in the day, thousands of mourners jammed a synagogue, a Jewish community center and a third, undisclosed site for the first in a weeklong series of funerals for victims of the deadliest anti-Semitic attack in U.S. history. Dr. Jerry Rabinowitz, Daniel Stein and Cecil and David Rosenthal were among 11 people killed in the shooting rampage at the Tree of Life synagogue Saturday. Robert Gregory Bowers, a 46-year-old truck driver who authorities say raged against Jews, was arrested on federal hate-crime charges that could bring the death penalty. With Tree of Life still cordoned off as a crime scene, more than 1,000 people poured into Rodef Shalom, one of the city’s oldest and largest synagogues, to mourn the Rosenthal brothers, ages 59 and 54. The two intellectually disabled men were “beautiful souls” who had “not an ounce of hate in them – something we’re terribly missing today,” Rabbi Jeffrey Myers, a survivor of the massacre, said at their funeral. 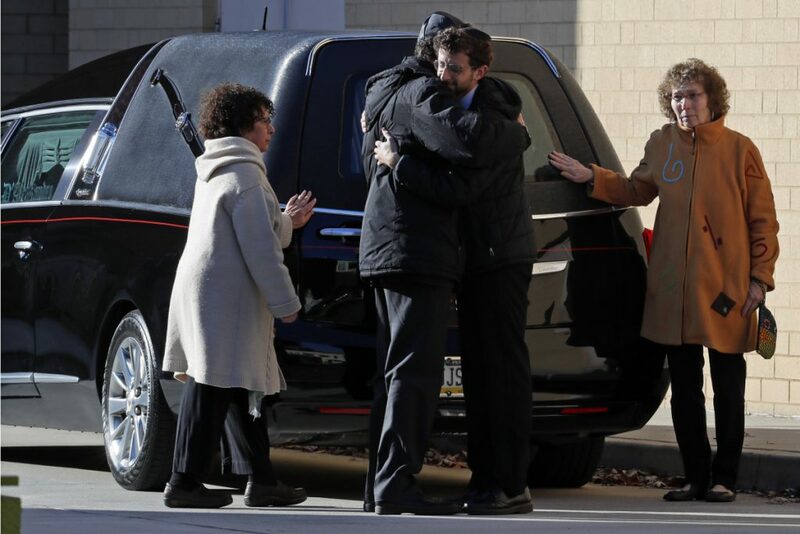 Mourners embrace after the hearse carrying the casket of Jerry Rabinowitz, one of 11 people killed while worshipping at the Tree of Life Synagogue on Saturday, arrives outside the Jewish Community Center in Pittsburgh on Tuesday. The brothers were widely known as “the boys,” the Rosenthals’ sister, Diane Hirt, noted. “They were innocent like boys, not hardened like men,” she said. She said Cecil – a gregarious man with a booming voice who was lightheartedly known as the mayor of Squirrel Hall and the “town crier” for the gossip he managed to gather – would have especially enjoyed the media attention this week, a thought that brought laughter from the congregation. 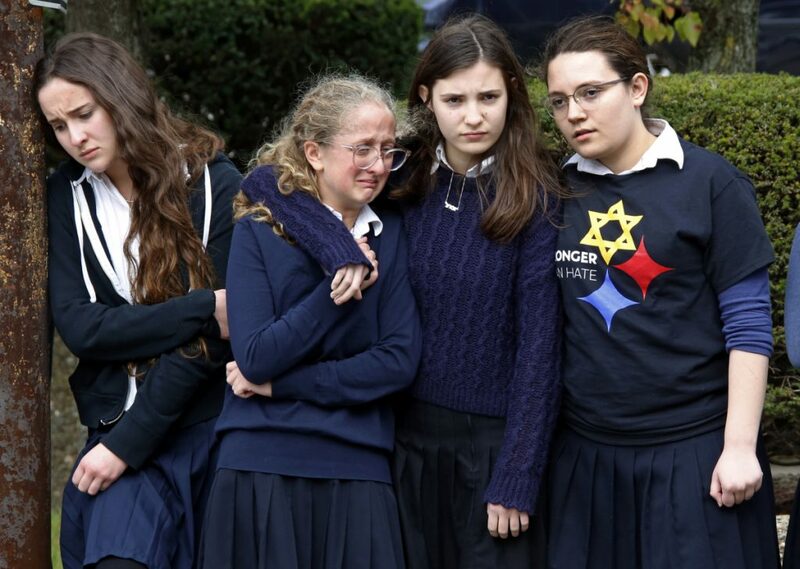 Rabinowitz’s funeral was held at the Jewish Community Center in the city’s Squirrel Hill section, the historic Jewish neighborhood where the rampage took place. Two police vehicles were posted at a side door and two at the main entrance. A line stretched around the block as mourners – some in white medical coats, some wearing yarmulkes, black hats or head scarves – passed beneath the blue Romanesque arches into the brick building. A private funeral was also held for Stein, the 71-year-old men’s club president at Tree of Life. President Trump and first lady Melania Trump walk past a memorial outside Pittsburgh’s Tree of Life Synagogue in Pittsburgh on Tuesday. The other victims’ funerals have been scheduled through Friday. 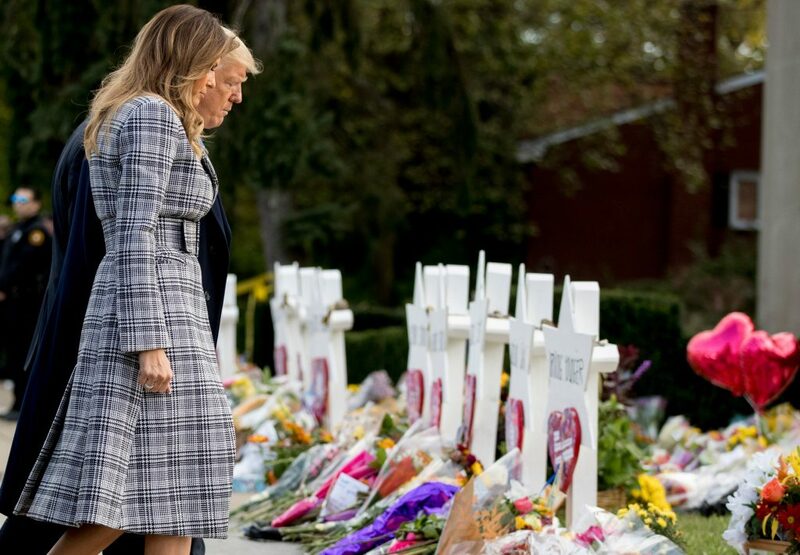 Trump and first lady Melania Trump landed in Pittsburgh after the day’s services and lit candles at Tree of Life for the victims. Outside, they laid white roses as well as stones for each of the dead, a Jewish burial tradition. The president and first lady later went to a hospital to visit with survivors. Hundreds of protesters gathered near the synagogue and the hospital. Another Squirrel Hill resident, Shayna Marcus, who had hoped to catch the presidential motorcade with her young sons but just missed it, said the anger at Trump is misplaced. “I don’t think focusing on Trump is the answer, or on politics,” said Marcus, a 34-year-old nurse and Trump supporter. Democratic Mayor Bill Peduto had asked Trump not to come while the city was burying its dead. He and Gov. Tom Wolf, a fellow Democrat, said they would skip the president’s visit. “Community leaders expressed to the governor that they did not feel it was appropriate for Trump to come, so the governor made a decision not to join him on his visit out of respect for the families and the community,” said Beth Melena, Wolf’s campaign spokeswoman. This story has been corrected to show that one of the funerals was held in a Jewish community center, not a synagogue.